Changing lives for the better, at the grassroot level, has been the most rewarding experience. We have helped numerous people stand on their feet and live a life of dignity. By the year 2020, we aim to directly benefit fifty thousand lives under our various initiatives. Tax benefit under section 80G. Women Empowerment project covered by BBC News. Education project recognized by “A World at School” – an international campaign in 85 countries. Projects granted eligibility under section 35AC by Central Govt. of India. Shree Raj Educational Centre’s school at Parli is a one-of-its-kind rural school having amenities and standards at par with any other urban school. The key thought behind this is to endow these children with the best formal education to make them into independent and confident individuals. FIRST English Medium School in entire Taluka. 1050+ students (academic year 2018-19) from 90 neighbouring villages in 40 km radius take benefit of highly subsidized education. 40% of students are girls – in spite of being a rural area. Fully equipped with Computer Lab, Dance & Music Academy, Library, Biology, Physics, Chemistry Labs, Activity rooms, Work-experience rooms & Staff rooms. Computers & E-learning initiated from 1st Standard. Uniforms, shoes, textbooks, notebooks and healthy protein-rich daily mid-day snack provided free. Entire facility fire compliant and kept under 24x7 CCTV surveillance. Rated 9/10 under the RTE Ratings by Govt. of Maharashtra on their website. First ‘Green school’ in the Taluka by adapting to Solar Power generation. 11 School Buses provided till their homes, saving hours of walking. Our effort to promote rural education– “Education First” has been recognized by “A World at School” – which is an international campaign in 85 countries. Parli was one of the most backward & undeveloped tribal belts of Maharashtra, with lack of even basic Medical Infrastructure and Facilities for a radius of 20 kms around the area. In the year 2004, our team of doctors voluntarily offered to conduct Medical Camps and thus began the journey of Shree Raj Medical Centre. Multiple Camps conducted from 2004 till date. 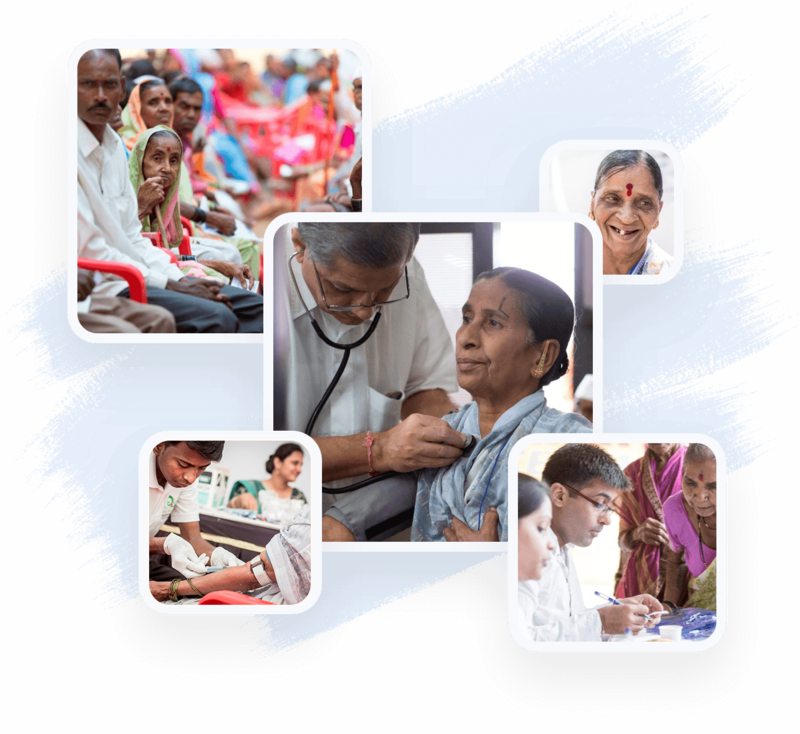 Various Diagnostic & Curative Camps conducted for under-privileged villagers on regular basis every year, like Mega Eye Camp, Dental, ENT, Pediatric, Gynaecology and General check-up. Team of Reputed & Senior Medical Practitioners such as Dentists, Skin Specialist, ENT Surgeon, Laproscopic Surgeon, Chest Physician, Homeopaths, etc. visit twice a week. Facilitation of Advanced Treatment at reputed Institutes and hospitals at Mumbai. 1400+ free cataract surgeries done so far, with 100% success rate. 6000+ villagers & tribal population across 100 villages provided better quality of life. Shramik Naari Sangh (Sa-Ni-Sa) undertakes economic empowerment of under-privileged and needy women to enable them earn a livelihood, run their families and become independent. Sa-Ni-Sa is a charitable society registered under The Societies Registration Act and The Bombay Public Trusts Act. Training and employment opportunities are provided in manufacturing of food products, tiffin services, corporate gift packs, premium chocolates, handcrafted bath & body care products and handicraft articles through its brands ‘Chaakri’, ‘Divinite’, ‘Puro’ and ‘Udaan’. 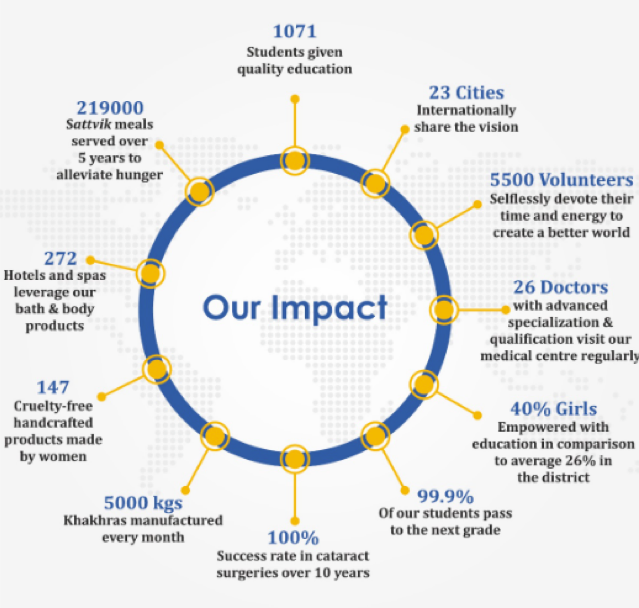 Chaakri : Empowers women by training them to make Khakhras with 100% whole grains and natural ingredients. All Khakhras are vacuum packed, have zero trans-fat, are FSSAI approved and recommended by nutritionists. Puro : Under-privileged women are trained to make Handcrafted Bath & Body Products that are without harmful, cancer-causing preservatives and chemicals. All Puro products are 100% vegetarian, non-toxic and FDA approved. Divinite : Women are trained by professional chocolatiers in the art of premium chocolate making and packaging. Chocolates are handmade, FSSAI approved and have unique flavours like chilli, cinnamon, blueberry, etc. Udaan : Trains women to make handicrafts, home decoratives, paper jewellery and products that are eco-friendly and income generating. Regular medical camps like general health, gynaecology, breast cancer, etc.